In recent years the automation team at Elos Medtech in Denmark has been working on several automation projects under the headline The Automated Factory. One of the benefits of automation is reduced human labor costs and expenses, and saved energy and materials. But more importantly it improves quality, accuracy and precision of products; key factors when manufacturing medical devices. It truly pays off to take a close look at all the processes in your production. 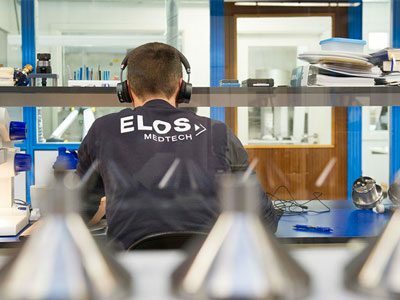 It was clearly evident with Elos Medtech’s successful transformation after approximately ten years of targeted optimisation, standardisation and automation based on the principles of LEAN. 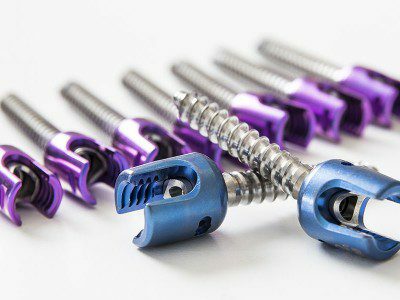 We are finding that more companies are interested in outsourcing parts of, or entire processes, to one single contract manufacturer, instead of using several manufacturers for different processes. The reason is higher demands on work processes, documentation, quality, accuracy, precision and repeatability. We see ourselves as a solution partner who can offer a complete performance to our customers, which includes an unbroken chain from design and manufacturing to packaging, distribution and logistics. In recent years a wave of automation has swept over the medtech industry worldwide, also in countries with lower labor costs than Denmark. This is a challenge that we have taken on. To be top of the line, we have made ambitious investments in the latest automation technology and new user-friendly and flexible production equipment. Almost the entire machine park has been replaced. The outcome of The Automated Factory speaks for itself: The number of efficient production hours has more than doubled. At the same time we produce 20% more items. We have established a dedicated automation department consisting mainly of employees from production, and moreover created a culture where employees come up with new ideas for more optimisation. We have managed to cut our lead time and the number of days between the placement of an order and delivery. Our internal transport has been automated by a mobile robot (MiR100), which runs a daily route of seven kilometres around the 8,000 square meters of workspace. 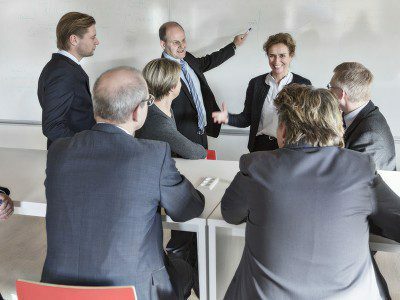 This small investment alone has released a full-time employee and improved the workflow. We have also decided to create one unified system for receiving goods and delivering finished products. 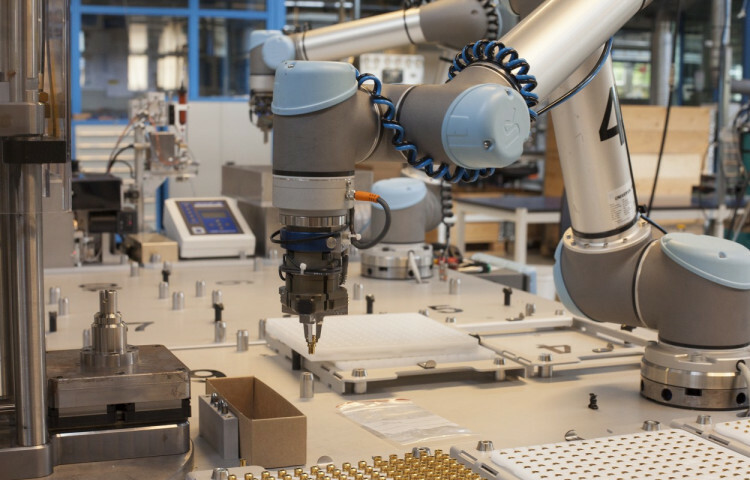 The goal is to create high flexibility and adaptability with a few standard workbenches where tools, robots and machines easily can be configured to carry out different tasks from day to day. Consequently, we have invested in user-friendly and versatile robots from Universal Robots. The result is improved production through more repetitive processes and equivalent products. The automation of robots enables us to meet the demands of the market for detailed documentation of production processes and product quality. Currently we are focusing on replacing manual random samples and measurements of components with a solution where robots and sensors automatically check each component after they have been processed. We expect that 50-80% of the manual random samples can be automated. LEAN has been used systematically as the foundation throughout the optimisation of Elos Medtech. Automation is a strategic focus area and consequently the investment budget has been used for automation to a greater extent than just a number of machines. Every time we have invested in new equipment it has been a requirement that the investment provides a more automated solution than previously. Our goal was to reduce the amount of repetitive work and to strengthen the quality assurance of our medical devices. We want to meet the high demands of tomorrow’s market with a wholehearted commitment to optimisation, automation and robotics. This far, it has succeeded so well that we have significantly strengthened our competitiveness, increased sales and created additional exports, while several new jobs have been created in the company. But once again, and more importantly, our customers can feel confident that we produce high quality medical devices with processes that are accurate and precise. As we see it, The Automated Factory is an ongoing project that will continue to evolve over time and run efficiently for years to come. Would you like to know more about our project? Don’t hesitate to contact me, I’m happy to answer your questions. And if you are, like us, a fan of social media – join us!